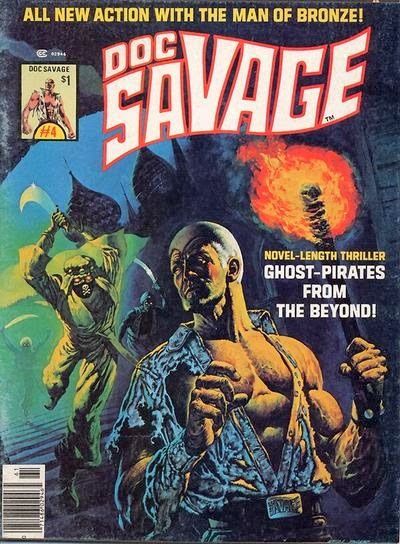 In this issue of Marvel Comics' black and white Doc Savage comic magazine (in my opinion, one of the best translations of Doc to comics form), Doc and the Amazing Five investigate the death of a friend of his, a quest that leads them to Casablanca, where they wind up meeting a potential ally at an establishment called the Blue Parrot. In the classic film Casablanca, the Blue Parrot was the bar owned by Signor Ferrari. Therefore, this story will be listed in Volume 3. That's cool. There's a Blue Parrot restaurant in Colorado. A not so good Italian place. Since Rick Blaine appeared in another issue, I'm guessing Doug Moench was a Casablanca fan. Who wrote this issue of Doc Savage? Was it Moench? The character Warmflash looks a lot like W.C. Fields. Moench is almost certainly a fan of old movies.